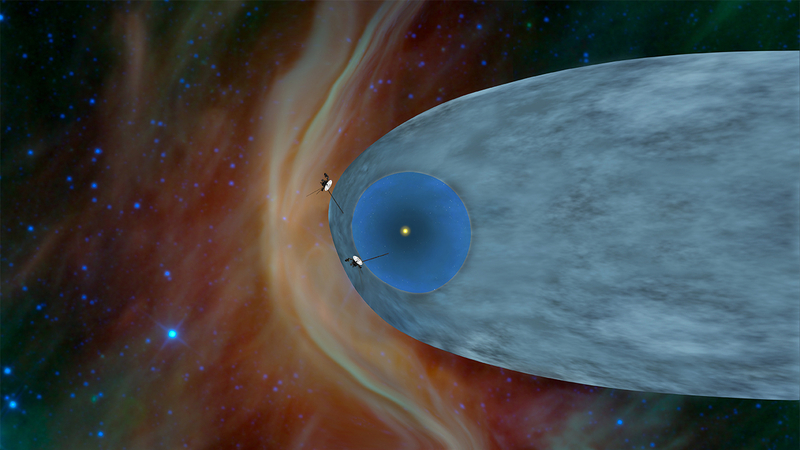 Voyager 1 has entered a region of space beyond our solar bubble, and it has sent back a little sound for us to listen to. Thirty-six years ago, from the ground in Florida, Voyager 1 launched into space. It traveled out of Earth's atmosphere, and it kept going. It passed Jupiter in 1979 and then Saturn in 1980. And then it kept going. In 1990, six billion miles from Earth, it looked back on the planets of our solar system, and photographed them all. And today, in a historic announcement, NASA revealed that this piece of machinery, built by humans here on our planet, has officially sailed beyond the region of solar winds around our sun and into interstellar space. The transition happened a year ago, around August 25, 2012, but scientists didn't realize it until recently, when they analyzed the vibrations made by an explosion on the sun in March of 2012, which arrived at the spacecraft in April 2013. As NASA explains, "The pitch of the oscillations helped scientists determine the density of the plasma. The particular oscillations meant the spacecraft was bathed in plasma more than 40 times denser than what they had encountered in the outer layer of the heliosphere. Density of this sort is to be expected in interstellar space." To listen to that sound, that distant whistle, sends shivers down my spine. This is the sound of an explosion on our sun, traveled 12 billion miles, and heard in interstellar space. Imagine Voyager, 36 years into its journey from our little planet, and listen to that sound, again and again.